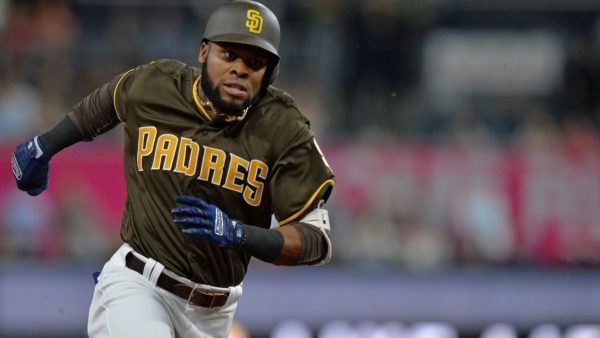 Manuel Margot had a disappointing 2018 season for the San Diego Padres. 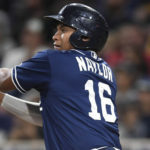 Can the young outfielder rebound in 2019 and put up the numbers that are expected from the Dominican right-handed hitter? 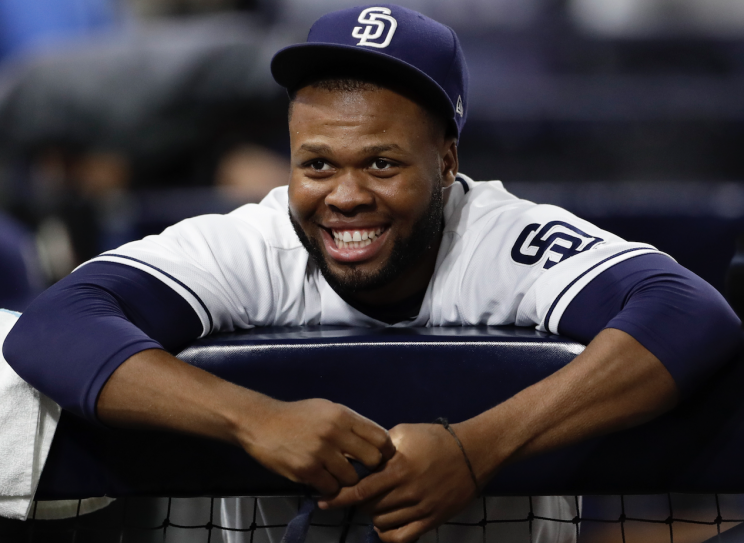 It is safe to say that Manuel Margot was hit with the dreaded “sophomore slump” in 2018. After collecting a respectable .263/.313/.409 batting line and a 90 wRC+ his rookie year, many Padres fans were hopeful that he would break out into something more. Those hopes were quickly diminished after a .245/.292/.384 season and a wRC+ of 81. This was not the breakout that many expected and it caused the center fielder to be dropped from the leadoff spot in the lineup all the way down to the bottom of the lineup, usually manning the seventh or eighth spot. Margot has plenty of potential and, at 24 years old, is young enough to rebound. But will we see the former top prospect bounce back in 2019, or continue to trend downward? Many blame Margot’s strikeout numbers, when in reality, they were a bit better in 2018. His K% dropped from 20.0% in 2017 to 17.0% in 2018 and he had 18 fewer strikeouts than the year before. However, his walk rate had a slight drop from last year, going from 6.6% in 2017 to 6.2% in 2018, but considering his number of walks dropped from 35 to 32, that’s not much of a concern. It is what happens when he makes contact with the ball that is a cause for concern. Not only did his ground ball rate go up (40.5%-43.0%), so did his fly ball rate (a slight uptick of 36.3% to 37.1%) and his infield fly ball rate (this time a spike of 7.8%, going from 9.5% to 17.2%). All of this caused his line drive rate to drop as a result, going from 23.2% in 2017 to 19.9% in 2018. His results can stem from many things. One, he changed his swing during the 2017 season and got into a massive slump to start the season off. He shrugged off the slow start and got hot before the All-Star break, but was then slowed down by a nagging wrist injury that could’ve affected Margot’s swing. Also, as he tinkered with the new swing throughout the season, it may have caused him to either get under too many balls or not make strong enough contact, resulting in the higher pop-up and ground ball rate. There is cause for hope though. Margot saw his hard contact rate jump up from 2017, going from 25.4% in 2017 to 39.3% in 2018, a whopping 13.4% increase. This resulted in both his soft contact (25.2% dropping to a 20.2%) and medium contact rate dropping (48.7% to 40.6%), and if he sticks to a line-drive approach, Margot could prove to be a fickle thorn in the sides of many a pitcher. Margot remains a valuable center fielder (even if his advanced numbers dropped in 2018) and his speed will always play. He will have to get smarter on the base paths as he got thrown out more times than he should have. While he has a lot to work on at the plate, he is still very young and San Diego has not given up on him. This past season proved itself as a learning experience for Margot and showed him what he needs to work on and what to improve. Margot still has the ceiling of an above-average center fielder, the likes of whom could make his way on to an all-star team. He had his struggles, yes, but so do many young players in the majors. Franmil Reyes is a prime example of a young player learning from his mistakes, making adjustments, and coming back strong to have a good season. 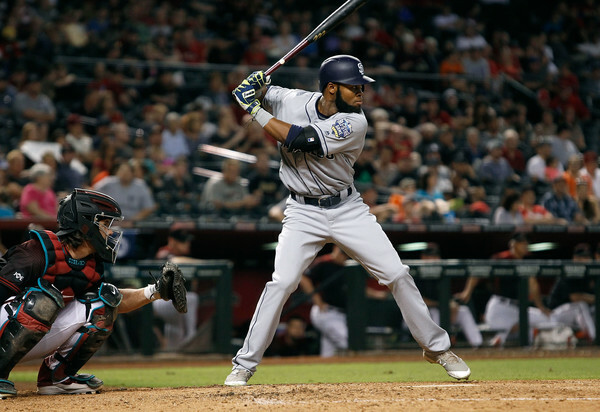 With his talent and an entire offseason to learn from his mistakes, all signs point to Margot following the same path as Reyes did and having a solid bounce-back season in 2019. I still see his talent and ability to be the best leadoff in the game….we forgot how impressed we were when we first saw him 3 yrs ago. Everything you need in a leadoff, we saw in him. But my guess is, his mechanics were tampered with..including his baserunning. And like any young player would, he spiraled downwards. If I were the hitting coach, Id go back to what worked when he was called up. I think Margot would benefit being sent down to AAA to work on his offensive game just like Reyes and Renfroe did.The Padres have a logjam in the outfield and this might be a better option than trading away Reyes or Renfroe. Rebound? If he puts up 2017-type numbers again he finds himself out of a job. Margot had a bunch of nagging injuries that aren’t likely to carry over. He may be out of a job eventually, since Franchy Cordero is probably the Padres’ near-future centerfielder, with much more potential.